Great news! I’ve always thought this part of Pennsylvania Ave, SE was a bit of a slow zone so it’ll be nice to see it get some new life (along with the soon to be Ba Bay Vietnamese Restaurant at 633 Pennsylvania Ave, SE). 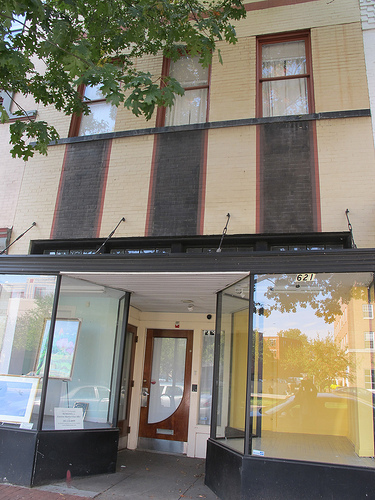 “Pound signed a lease on a fantastic historic space at 621 Penn Ave SE. The new Pound will be almost twice the size of the existing cafe and will allow us to significantly grow our “comfort food from around the world” offering. We will of course maintain our focus on premium organic fair trade coffees and lattes, continuing to be the exclusive provider of 2010 Top Micro-Roaster in the country, Kickapoo Coffee from Wisconsin, as well. The larger space will allow us to separate the dining traffic from the chill and relaxing coffee house area and vibe. We also have a beautiful large back enclosed patio covered by old growth Oak trees that will really make this a unique cafe destination on the Hill. Front sidewalk seating will also be available, as well as comfy seating right in the bay window frontage on Penn. I’ll be sure to update as construction progresses and an opening date is selected. Pound Coffee currently has a location in NoMa at 1300 2nd St NE.